Today my three year old requested I take him out to lunch after picking him up at preschool. I might have agreed, had I not already taken him out to lunch the day before. But since today was Friday and the last day of school until January 3, 2012 (yikes, 2012! ), I told him we could eat lunch at home and then go out for ice cream. Deal. Of course, I never thought that three hours later, he’d suddenly wake up from his nap and throw up his stomach contents all over his bed and carpet, and continue with the sick stomach performance for several hours after that. Ah, the joys of motherhood… Sorry, I hope you weren’t eating and reading this at the same time. 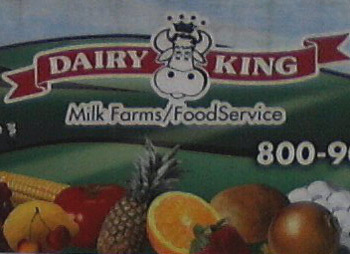 Ah-ha, it’s the logo for Dairy King, a company I never saw or heard of until today. How is that for a coincidence? So I officially introduced the two to each other. Dairy Queen, meet Dairy King. A match made in ice cream heaven. Now, are you ready to have a Merry Dairy Christmas? Next Post Will someone please make these cows happy? 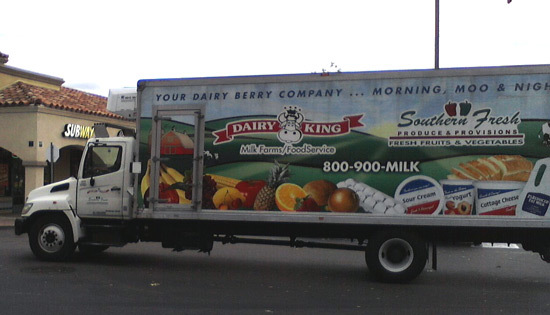 Is a Dairy King a Bull?